Can't believe the transformation! You must be delighted with it, looks fantastic. Well done, both of you :) Now sit back and enjoy it! Excellent job done! Well done to you both! Great result Sandra.Quick tip...site your waterlily away from the splashing water...the flowers close up when it is raining and they dislike being splashed ! Sandra, cannot believe my eyes! It's more more beautiful! Well-done both of you! Well done to you both,looks fantastic.Sit back and enjoy !!! ponds very pretty Sandra great to relax in on hearing waterfall. Hope not Sandra -have you heard of this on the weather news for next week? I think I agree in this case Sandra I so hope they are wrong with this!! I am sure that your son will be OK Sandra and will get home when the planes start to fly again. At least he has plenty of company-if he anything like I was at that age he is probably enjoying the extra time that he has in Athens. 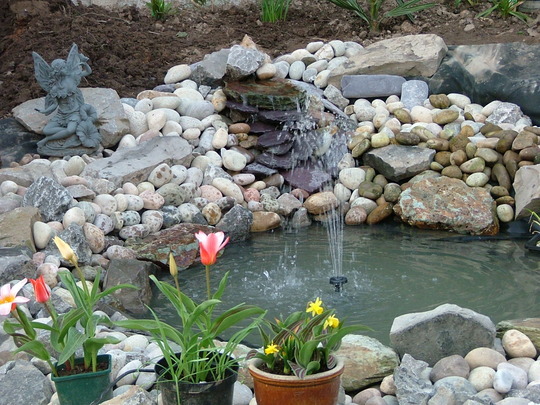 It's a bit too heavy on the hardscape surrounding your pond and seems to be out of proportion to the ponds diameter. Actually it has the appearance of a meteorite crater. I would suggest that you remove some areas of the egg rock and place some plantings into those pockets for a more natural look. dont think i like you tone and i had just made the pond actually and now its alot different with alot of planting,so please be carefull with your comments. also i love my pond but unfortunatly dont like you. Well said San, flipping cheek!! who asked them anyway? notice they have not written anything about themselves, always suspicious!! thanx for your surport dotty, its very suspicious i agree.must not have anything better to do in their lives. I agree with Dottydaisy's comment. I think it looks great and I also think if you've nothing nice to say about something, then don't say anything at all! Cheek. as for frog home iv used a spare ridge tile left over from the porch roof, its ideal as a home for frogs, casper cant get into it and its thick enough for warmth with leaves in.